If you are looking for a quick, simple, easy and yet healthy breakfast recipe then look no further; this instant rava uttapam recipe is one of the best ways to enjoy your most important meal of the day and get going with your day in less than 30 minutes. 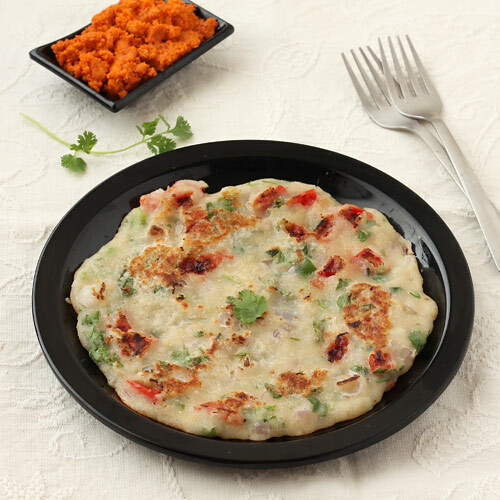 In this bachelor or beginner friendly recipe, semolina (sooji, rava), is mixed with curd, cut veggies and spices into batter and then thick shallow-fried pancakes like uttapams are prepared from it. 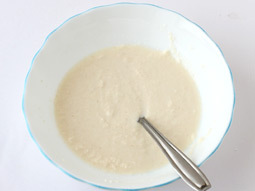 This step by step photo recipe’s unique batter spreading technique, tips and variations will help you prepare your instant breakfast in no time. 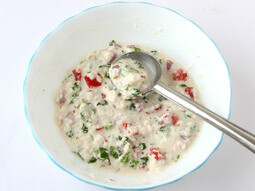 Take rava, sour curd and salt in a large bowl. Mix well using spoon by gradually adding water (approx. 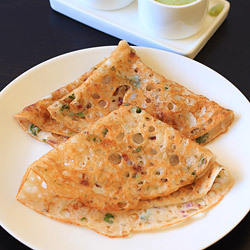 1-cup) until batter has thick yet watery consistency (like pancake batter or slightly thicker than dosa batter). Keep it aside for 20-minutes. 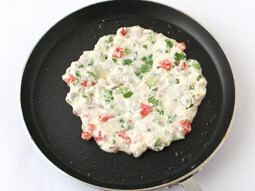 Add onion, capsicum, tomato, green chillies, ginger, coriander leaves and 1 teaspoon oil in the batter. Mix well and again check for consistency. (Rava/semolina absorbs water as time goes by and batter becomes thick after some time due to that.) If required, add extra water and mix well to make sure that it has thick consistency. 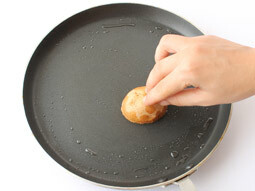 When tawa is medium hot, reduce flame to low and pour a ladle full batter (approx. 1/2 cup) and spread it into the circle with the help of ladle. It should have around 1/4-inch thickness and approx. 5-6 inches of diameter. Drizzle 1-teaspoon oil around the edge. Cook until color of top surface changes from white to off-white and bottom side turns light brown for approx. 2-3 minutes. Flip it gently and cook another side over medium flame until bottom surface turns light brown in color, it will take around 1-2 minutes. Flip it again and cook for 30-seconds. Transfer it to a plate. Prepare suji uttapams from remaining batter by following steps from step-5 to step-10. Serve hot with tomato ketchup or tomato chutney. 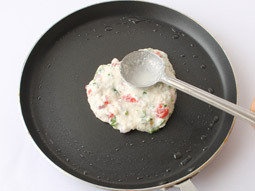 To spread batter easily and evenly in step-6 without using halved onion or halved potato technique, sprinkle few drops of water on the surface of hot tawa and wait until water evaporates and then pour and spread the batter (if you are using this technique then there is no need to add few drops of oil in step-5). You can add 1/2 cup plain buttermilk instead of 1/4 cup yogurt in this recipe, add less water (approx. 3/4 cup or less) while making the batter. This recipe best suited for bachelors and beginners. For variation, sprinkle mixed vegetables over top surface after spreading the batter instead of mixing them with batter in step-6. Serving Ideas: Serve south Indian rava uttapams hot or warm with your favorite coconut chutney or idli podi in the breakfast. You can also enjoy it with tea or coffee. The recipe turned out great. To make it more healthy I also added grated carrot. Thank you for sharing. I like all the recipes. It's fantastic. Delicious food...which is my fav....n thanks for share the recipe with us....I will try. Thank-you for your guidance and support for easy receipe of untappm. My uttapam is sticking to tawa al time. What to do? Response: Hello Neeta, follow the below given tips to prevent the sticking of uttapam. 1. If possible, use the non-stick tava/griddle. 2. Grease the tava with oil before making each uttapam. 3. Make sure the tava is medium hot before pouring the batter over tava. Very delicious. Kids loved this Rava uttapam. I am a great fan of your recipes. U are best and thank u... Only u are who made me good daughter in law who cooks tasty food..
You are the person who makes me stronger in cooking. Thanks a lot for this recipe. I am just gonna mad for this RAVA UTTAPAM. Easy to cook, tastes delicious! Hi, I tried & it's super duper hit. Thanks for sharing the recipe. Can we use lemon juice instead of curd? Response: Curd gives the soft texture and mild sour taste to uttpam. If the curd is not available, you can use the lemon juice instead of it. It's breaking... why my cheela breaks while turning? Response: Hello Smita, the main reason behind the breaking cheela is that when you flip them little early they will break and another reason is the too much watery batter. When you try this next time, let them cook until the upper surface looks little cooked (indication- slightly color changed) and keep the batter little thick. Can we use Maize rava? Do we need to alter any measurements? Response: Hello Uzma, I have never tried to make uttapam with maize rava so I am not able to give you the answer. If curd is not available then is it ok? Response: Hello Ashruti, if curd is not available, either use buttermilk or add 1teaspoon lemon juice instead of it. Can I use butter-milk instead of water and curd? What would be the thinness of Uttapam? If its thick, then inside is not cooking properly. Response: Yes, you can use buttermilk instead of curd and water. Uttapam should be 1/2 inch thick. 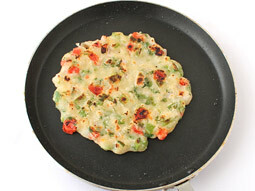 Cook the uttapam on low-medium flame for cooking inside perfectly. I want to ask you one question. 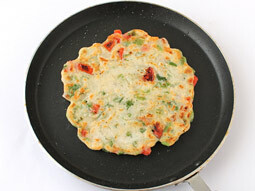 Is rava uttapam a diet recipe? Can we add in diet menu? Response: Hello Trusha, rava is made from the wheat. So, if you add the wheat flour in your diet menu, you can add the rava uttapam in your diet menu plan. 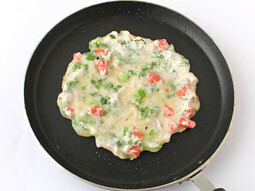 Try to use less oil (or no oil at all) to shallow fry the uttapam. 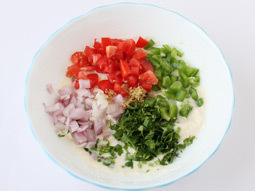 I tried upma, idli and few chutney all are superb recipes. Can I use curd instead of water? Response: Yes, you can use curd instead of water. Simple and easy !! Loved it !! Tried yesterday as per your nice explanation. It came out really yummy. Thanks. Which cup is used for measurement, small or large? Response: We have used the 250 ml cup to measure all ingredients in all the recipes. Very nicely explained. Very helpful. Response: Hi Kirti, use non-stick tava and heat it well and grease it well before pouring the batter over it to prevent sticking. Very nicely explained recipe. I will share it with my bachelor son and his friends. Thanks. Excellent and a very easily explalined recipie. Thanks. Can we use matha instead of curd? Response: Yes, you can use mattha (not sweet) instead of curd. 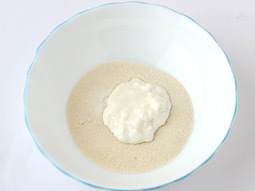 Add 1/2 cup mattha instead of 1/4 cup curd and reduce the quantity of water to 3/4 cup (or little less) while making the batter. Which type of suji used in uttapam, roasted suzi or normal suzi? Response: Hi Deepika, normal suji is used to make this dish. Thank you. My mummy likes this recipe so much. It was really yum. Everyone liked it in my family. Thanks. Very nice and simple recipe. Thanks. Can I use lassi instead of curd? Response: Hi, you can use lassi instead of curd. Adjust the amount of water according to it because lassi contains more water portion compared to curd. Can I use normal yogurt instead of sour? Response: Yes, you can use normal yogurt, add 1 teaspoon lemon juice for mild sour taste.